meetup Archives | It`s full of stars! Our 2nd event in Rio de Janeiro and the 1st Meetup in Rio. 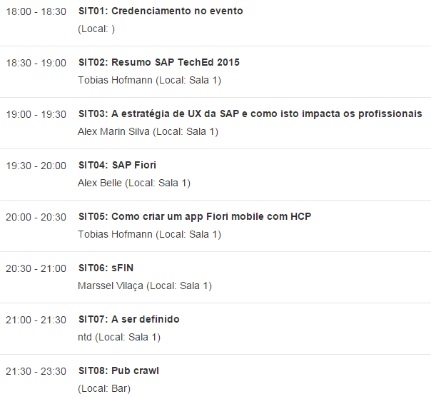 This time the event was located at INFNET, located directly in the downtown area, close to some of the biggest SAP customers in Rio and also close to partner offices. INFNET is also a SAP University Alliance partner, so great initiative from them to help us. Special thanks here also to SONDA IT, as they divulged the event internally. To no surprise, a large amount of participants was from SONDA. Being active in the SAP community can give you an unfair competitive advantage. The event site was hosted on a Raspberry Pi using a OpenUI5 web page with the backend for user registration run on HCP (Java). As expected, almost all access to the site was done from Brazil.